We are incredibly excited to announce that we have been awarded funding from the Commonwealth Legacy Active Places Fund, Partick West Area Partnership and Hillhead Partnership, we now have now begun the work outlined below in partnership with Glasgow City Council. It is so exciting to watch our park improvements coming to life. The beautiful sandstone amphitheatre is complete and we are so pleased with it. The cycle path round the football pitch is also finished, now opening up the whole park for a walk or a cycle. The willow tunnel is almost complete and thanks to Shirley for her work and all helpers in our building day. Huge thanks to Area West Partnership who have awarded us funding to paint 50% of our railings round the Park. That should be done soon. Planting comes next and then the finishing touches. What a journey it’s been but we almost there. HPPA is over the moon to have been selected to take part in the Bags of Help fundraising scheme. This is awarded by Tesco from money raised by customers through the 5p bag charge to go directly back into the local community. 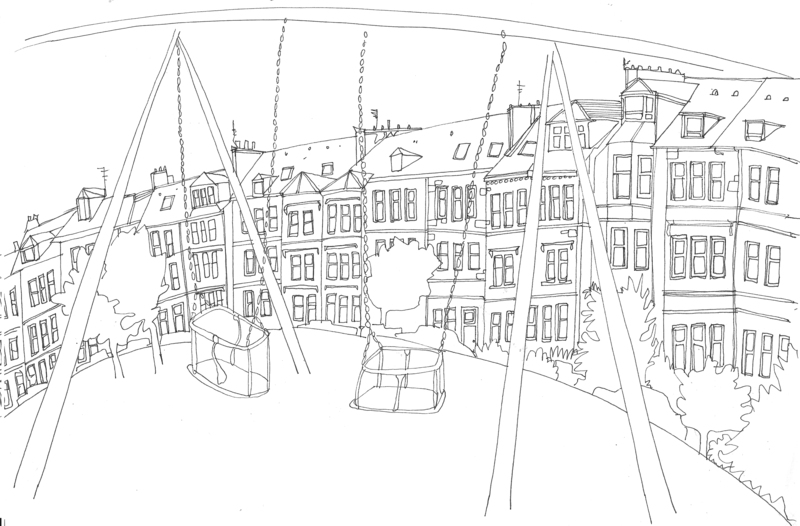 The Hayburn Playpark Upgrade proposal will be on display for customers to vote on in the Maryhill store and the project with the most votes will receive increased funding for their project. The football pitch surfacing has now been replaced and a landscaped terrace and new stairs to the pitch have been created. We have three new picnic tables, one with disabled and pram access and many new benches and rubbish bins. Our two new hammocks have been installed and we have lovingly restored everyone’s favourite monkey bars! There was nothing new that could replace the 1980s classic and so it was rebuilt to the original design and new play surfacing fitted. We planted our orchard and thanks to everyone who braved the rain to help us. We now have 12 fruit trees and 8 fruit bushes. Next phase of renovation is scheduled for March 2016. In 2014 the HPPA secured funding from the Area Partnership Fund to carry out essential repairs (football goals) and employ play space designers to develop a concept design for future park development. This focussed on the improvement of the current play areas and community facilities, which have been developed with users of all ages of the park in mind. 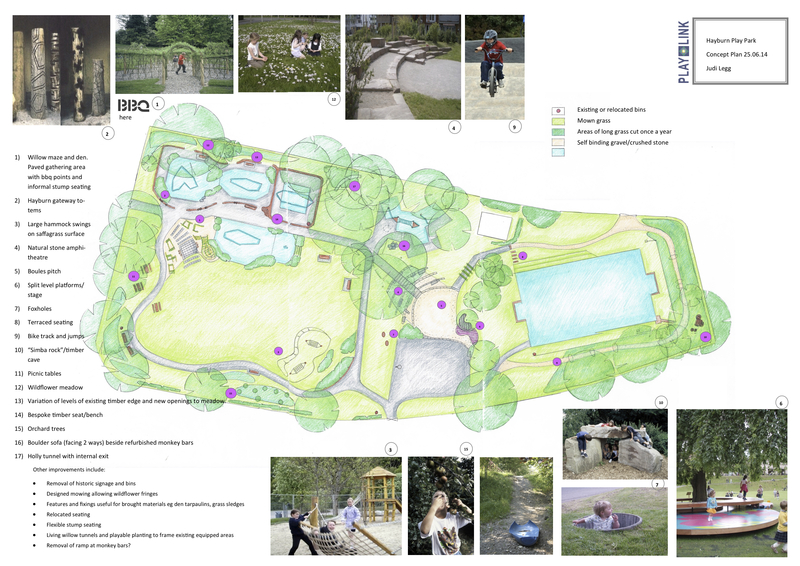 We made the decision to move away from adding further ‘off-the-peg’ play equipment, and instead wanted to promote the use of the park’s landscape and features as space for imaginative play, social time and rigorous activity. The restoration of the beloved ‘monkey bars’ and the creation of a bike circuit around the football pitch, will create extra space for exercise. Terraced seating and a natural stone amphitheatre, will make social spaces around play and sports activities, such as performances (as play or organised events), football, basketball, and boules. The planting of wildflower meadows, long grass areas, orchard trees and extra shrubs, will not only provide extra imaginative play spaces, but also promote a connection with nature and the seasons for children and older users alike. We welcome any input users of the park and the local community may have to offer. If you have experience of fundraising, organising events, gardening or none of these, we welcome enthusiastic volunteers and potential new members of the association.